The last few Africa Cup of Nations have been plagued by poor pitches. At a time when the standard Football Opinion about African football and AFCON is negative – with popular myths like “it’s physical”, “the players are raw have limited technical ability” etc – it can’t be helping matters to be constantly playing the biggest matches of the year on surfaces that seem to be ploughed fields. The pitch in Libreville tonight was a good example of this. It can’t be a complete coincidence that so many shots and crosses were flying into the crowd. Criticise the players for a poor showing well into the tournament, of course, but there’s only so much you can do on that kind of pitch. It’s making African players look far less talented than they actually are and is a poor advert for the continent’s football, as well as being the cause of injuries to several key players. CAF and the federations need to work on this. Prejuce Nakoulma has been described by various SFG bandieras at various times as a “tank”. It’s an apt description. The Burkinabe winger has been one of the most impressive players at this tournament overall, with great movement in creating space for others and putting his name on the scoresheet twice. However, what was less impressive was his display of finishing against Egypt. 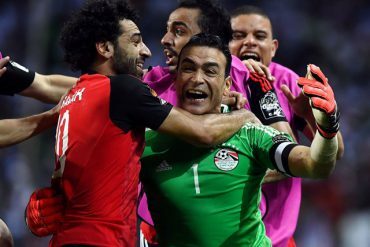 Yes, the Egyptian defenders provided a red wall that was difficult to penetrate and moved the Stallions attackers into awkward positions which made it hard to get shots away – huge credit has to go to them for this. And the pitch wasn’t helping matters. But if you’re going to qualify for an Africa Cup of Nations final, you really have to be hitting the target with some of your shots, ideally with some venom and direction. Nakoulma was struggling to hit the proverbial cow with the banjo he’d been armed with. More often than not, he would get into good positions and then slice the ball into the crowd, failing to make Essam El-Hadary work. He wasn’t alone in this amongst the Burkinabe players but he was clearly the most notable, missing half-chance after half-chance. Pack the right boots for the next big game, Prejuce. What Nakoulma couldn’t do, Mohamed Salah could. Teams need their big players to step up in this sort of game. Salah entered this tournament as Egypt’s great hope, the successor to Mohamed Aboutreika, and one of Africa’s outstanding players of recent years, who had yet to appear at the continent’s showpiece event. His performances in the tournament so far had been hit-and-miss, but he remained the player most likely to pull something out of the bag for the Pharaohs. In the 67th minute, out came the rabbit. It was a wonderful finish from Salah, the kind we’d expect from a quality player like him, which lit up what had otherwise been a game of great passing and poor finishing. Lionel Messi scored one very similar against Atletico Madrid tonight, but Salah’s will get a lot less coverage in Europe despite being just as sweet. There lies the difference between a player like Nakoulma – clearly talented but needing to hone the finer parts of his game if he’s ever to play at a high level (which at 29 seems unlikely) – and Salah, a star player in both continents he plays on. If Egypt go on to win the final, it will be with him playing another significant role. On the other side, credit must again go to Aristide Bance. After his crucial free kick against Tunisia took Burkina Faso into the last four, he was chosen for a starting berth – a slightly controversial decision, given that it removed the possibility of using him as an impact substitute again, and left Banou Diawara still stuck on the bench. In the end, he came up with the goods for the second match in a row. It was a lovely finish – calm and understated, and yet very Bance. It almost had shades of the way an on-form Zlatan Ibrahimovic can just bring the ball out of the sky and slot it into the goal at will. Bance is always full of braggadocio, but this expression is the big man at his most confident as a player. You could see it every time he was on the ball – he looked in control, and it was frustrating to see Burkina Faso not try to get him on the ball more, although that was a reflection in part of how deep Egypt were defending and how well-organised they were to keep him out of the game. After the goal, Paulo Duarte added Diawara, and the pair seemed to be hooking up well in a little-and-large partnership. But then Duarte, who evidently hasn’t seen Bance’s panenka penalty from the semi-final shootout in 2013, sacrificed the big man for Alain Traore, who proceeded to do very little other than score his penalty. It seemed a poor decision at the time, and with Nakoulma tiring and Bertrand Traore going on to miss his spot kick, the Stallion attack petered out, confirming that it probably was. But I guess we’ll never know. At 32, Bance’s last chance for a winner’s medal may just have passed, but his place in the African Football Hall of Fame is now assured.